Introduction: In patients undergoing reoperative abdominopelvic operations, reconstructive options to cover intrapelvic defects may be limited. Aim: We aimed to describe a unique series of small bowel seromuscular flaps used to obliterate intrapelvic defects. Methods: We performed a retrospective review of all patients undergoing a seromuscular small bowel flap at a single tertiary care institution from 2006 to 2018. 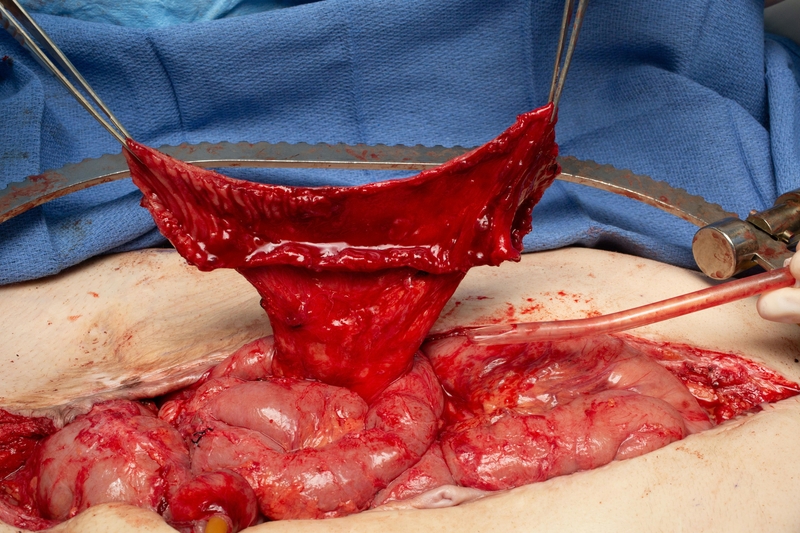 In all cases, a piece of small bowel was excluded using stapling devices, taking care not to injure the blood supply. The antimesenteric border was fully opened to reveal the mucosal surface, and the entire mucosa was stripped from the underlying muscularis. The flap was then inset into the defect with the muscular layer apposing the raw surface of the pelvis and secured in place with absorbable sutures. Results: We identified 13 patients who met our inclusion criteria. Median age at time of operation was 59 years (range 39-79 years). The indications for surgery included fistulizing Crohns disease (n=8), cancer (n=3), and chronic infections (n=2). In all patients, no residual omentum was available and VRAM was not feasible due to prior operative scars. Thirty day morbidity occurred in 46% of patients and included urine leak from ureteral injury, anastomotic leak, acute kidney injury, and superficial surgical site infection. No flaps became ischemic or required removal in the postoperative setting. Conclusion: Small bowel seromuscular flaps are a feasible and safe alternative for covering pelvic defects in patients who are undergoing reoperative surgery without the option to use traditional omental and muscular flaps.